Description: The beauty of natural Holly inspires this Tiffany styled masterpiece. 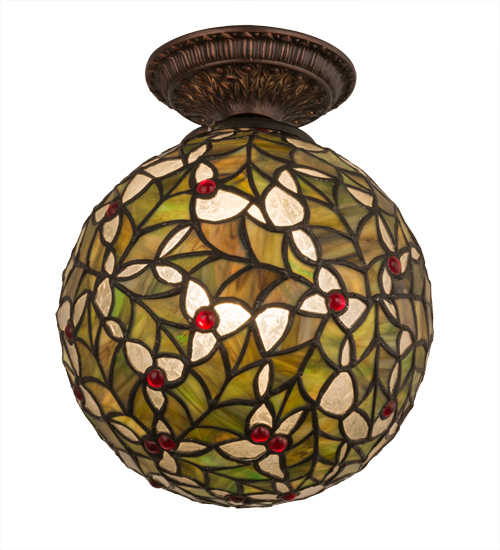 The Orb shaped ceiling fixture reveals an intricate leaf design in various Green art glass colors which is complemented with Clear Gluechip and Berry Red jewel accents. Holly greenery was originally used to help celebrate winter and new growth. This fixture is handcrafted of authentic stained art glass using the famous Meyda copperfoil construction method. The stunning, hardware is detailed with a coordinating leaf motif in a warm Mahogany Bronze finish. Custom colors, sizes and finishes, as well as and dimmable lamping options such as LED are also available. UL and cUL listed for dry and damp locations.